This course describes a series of meditation exercises and some practical advice on how to apply them. It works best if you follow the course progressively, giving each sequence of instructions a good 'work-out' before proceeding further. Meditation is the intelligent heart of the Buddha's way; the only criterion is that you should apply it to daily life. The purpose of this meditation course is not to create a system of beliefs, but rather to give guidance on how to see clearly into the nature of the mind. In this way, you can have first-hand understanding of the way things are, without reliance on opinions or theories - a direct experience, which has its own vitality. This course has been prepared with both beginners and experienced practitioners in mind. A feature of this workshop is that you are encouraged to share your meditation experience with others, as it will enrich not only their practice but also your own as well. So your questions and my responses will be posted here as we go along. Above all, feel free to ask for clarification on any aspect of the practice presented here. The Internet is a new medium to learn the ancient art of meditation but it is still mostly text based. This Online meditation workshop can be more interactive with your involvement. To facilitate this, there is a question form in the program, which you can use to ask questions about the practice and the answers will be e-mailed back to you. It is necessary to appreciate the nature of ‘practice' as applied to meditation as it could mistakenly be taken to imply the notion of control. This is far from the case, as the meditator needs to maintain sensitivity and a flowing receptivity to the experience without deliberately controlling it. Discipline in the meditation context can also be misunderstood as imposing one's will to control the practice; actually, it is no more than following and persistently applying the instructions. So correct practice is just repeated performance to develop skills, without controlling or interfering with the experience. It's developmental - the way to growth! An important consideration for the meditator at the beginning of the practice is to notice how you are relating to your experience or what your attitude to it is. If it happens to be reactive or judgmental then it is necessary to change the way you relate to things, situations or people, by cultivating qualities of friendliness, empathy and that of ‘letting go'. Actually, by being more accepting and allowing, without the struggle to gain something, will enhance the practice and facilitate a natural meditative state. (c) Discernment - which upon maturity, is the wisdom that sees the true nature of mind and existence. Traditionally there are five rules of conduct formally undertaken, or are here implicitly accepted, as the prerequisite for meditation. They are the foundations that good practice is based on, without them good concentration cannot be attained. These restraints need to be considered and respected, as they act as protectors for your well-being on the meditation path: 1) refraining from harming or taking life; 2) from taking what is not given; 3) from the misuse of the senses; 4) from false and harsh speech; and 5) the taking of intoxicants which clouds the mind. This is the ethical underpinning of the threefold system. But they are not to be considered as mere ‘no-nos' as they are balanced by the cultivation of positive behaviour: honesty, generosity, kindness, etc. The quality of recollectedness or full awareness is acquired through the development and the managing of three meditation skills: Right Effort, Right Attention and Right Concentration. Effort is right in the sense of arousing, sustaining and balancing the effort; meditative attention is right when there is close and impartial attention to the various meditation objects as they arise; concentration is right when it centres upon and intensifies the meditative focus. Too much effort makes the mind restless; not enough makes the mind slack; too much concentration restricts the awareness, not enough and the mind loses its focus; but there can never be too much attentiveness, as the acuity of attention is the factor which will deepen the practice. The successful managing of these meditation skills will produce mindfulness or presence of mind, the prerequisite for a finely tuned discernment. Discernment is the intelligence that uncovers the true nature of things by seeing through the 'content' mind to the underlying processes. This presupposes a non­reactive awareness with a perfectly attuned attitude and a penetrative attentiveness, which has the potential to see ‘what really is'. The outcome of such practice is direct ‘experiential' knowledge of the three universal characteristics of existence: change, unsatisfactoriness and impersonal process which culminates in a series of insights freeing one's ‘view' from the distortions caused by ignorance. Mental impurities are said to be present in three stratified layers in the mind: 1) dormant 2) manifest and 3) expressed. These impurities, or the three poisons of greed, hatred and ignorance, can be dealt with in three ways: first their expression can be restrained by harmonising one's behaviour; secondly, when they manifest in the mind, for example as angry thoughts, then they can be skillfully suppressed through concentration practices in serenity meditation; eventually when they are seen at their primary source or dormant level then they can be eradicated through insight meditation. Here's an example of how the three-fold strategy is used to deal with our most troublesome negative emotion ­anger: first restraining your behaviour in a situation where anger arises by not giving it a chance to be expressed; as soon as anger surfaces in the mind as negative thoughts then a serenity meditation technique will calm the anger in the mind. But it is only through insight meditation where the ego-illusion is seen at its primary source, as the notion of ‘me' and ‘mine', can the anger at the dormant level be seen with the possibility of eradicated it at its source. It is important at the beginning of this course for you to thoroughly understand the two types of meditation. Because it will contribute to your ability to adjust and manage your own evolving practice, especially if you do not have the guidance of a personal teacher. There are two types of meditation: ‘Calm' and ‘Insight'. Calming or serenity meditations use techniques of 'fixing' on a single object, excluding all secondary objects to produce calm and one-pointedness. Examples are techniques using visualisation, following the respiration, mantras and contemplation. The second meditation mode is practices that develop awareness. That is, paying close attention to the predominant object in your physical and mental experience with an moment-to-moment awareness. The result of this meditative attention will lead to insight knowledge. The ability to manage yourself in meditation, depends on making appropriate adjustments or 'fine tuning' during a practice session. This ability is based on understanding these two modes of meditation. For example, if you become strained or tense during insight meditation, switching to the serenity meditation mode will calm and relax the mind; or if you became stuck in a becalmed mind-state in serenity meditation, you can invigorate the mind with an awareness exercise to give it an investigative edge. For the meditation practice to be skilful it needs to be based on understanding the framework of practice and doing the preparatory work as outlined above. The practice of insight meditation revolves around the art of meditative attention. Its basic tool is 'bare' or primary attention, which uncovers or lays bare things as they really are. In this way, a non-reactive, unconditioned awareness is acquired that leads to insight knowledge. The basic tool in meditative attention is the practice of 'bare' attention. It is the 'primary' attention that sees through the 'content' mind to the underlying processes. In laying bare the reality of mind/body phenomena, bare attention reveals their salient characteristics without interfering with them. The art of 'bare' attention is to register the predominant object in your experience as it arises, without preference. That is, noting the changing phenomenon without reaction ­be it sensation, sound, thought or a mind-state. However, if there is a reaction during the observation, as is natural for the untrained mind, then that too must be noted. The practice of bare attention is used in conjunction with the 'four spheres of attention'. This is experiencing the body through its primary elements, (earth, air, fire and water) that is, hardness, softness, temperature, fluidity and movement within the body. Together with awareness of the four body postures: sitting, standing, walking and lying-down as well as movements and actions in daily activities. Is noting the feeling quality as either pleasant, unpleasant or neutral while being careful to differentiate the primary or bare feeling from the emotional elaboration or story. The awareness of consciousness is the 'knowing' of anything - for example, a physical sensation and the knowing of it. Also particular attention is paid to the mind-states, for example - happiness, sadness, agitation, and noticing their arising and passing away or impermanent nature. This is not analysing or classifying mental events, but using the attention to passively register the 'things of the mind': thoughts, ideas, and concepts, as a witness without any commentary. It is not the intention to stop the thinking, but to insight into the nature of thought. An exercise in 'bare' attention . . . Here's how to establish the habit of using 'bare attention' while focused on the four spheres of attention: First come to attention by simply noting whatever is predominant in your experience at this moment. For example, as you are sitting. Notice the touch sensations from the body's contact to the cushion/chair. There is the experience of a quality of hardness or softness (the earth element in the body). There is a feeling quality present from the contact - probably a neutral feeling (the sphere of feelings); there's the knowing of it (the consciousness) and you might think about the experience of the touch (thought, or the mental content). Now, try using bare attention to just register the sensations of touch, say on the keyboard or in sitting, note the feeling that arises, the knowing of it, and any thinking about the experience. It actually very simple - it just a matter of remembering to do it as a practice, so that it becomes ingrained as an ‘awareness habit' that automatically arises for you and supports the bare attention in daily life. A useful device to support meditative attention is naming or labeling the various objects during the observation of your own body and mind. Used judiciously, it is a useful tool to assist in focusing and sustaining the meditative attention. The noting is done by repeatedly making a mental note of whatever arises in your body/mind experience as it arises. For example, 'hearing, hearing', 'thinking, thinking', 'touching, touching', etc. This can be a powerful aid to help establish the attention, especially at the beginning of the practice, when it is necessary to systematically note as much as possible to stabilise the attention. Otherwise, you are likely to get lost in unnoticed wanderings with long periods of inattention. The noting practice can be combined with the practice of orientating to the Six Sense-Doors by the naming of the physical and mental objects as they arise. It needs to be pointed out that during mental noting, you must not analyse, interfere or identify with what is being observed (e.g. just note 'thinking, thinking' rather than 'I am thinking, it is me that is thinking'). The exact words used in noting aren't important - it's just naming or labelling the experience to support the attention. Once you have established deep meditative attention the noting can be dropped as it can interfere with the direct experience, which is always unique and fresh. Turn off your computer monitor, sit quietly with eyes closed and see if you can sustain the noting of the rising and falling of the abdomen or any other mental and physical phenomena arising at one of the six sense-doors. At every moment of noting, there is Right Effort, Right Awareness and Right Concentration - the three meditation factors on the Path of Insight. It is important just to note whatever phenomena arises and not to get caught up in judgments about whether it is good, bad or indifferent. For example, if you sit in meditation for say half an hour and you are aware that the mind has been wandering for most of that time, just note: 'wandering', 'wandering'. The Insight Meditator's practise is to note with full attention and equanimity at every opportunity, without judgement! Meditation is not confined to the sitting crossed-legged posture, especially not insight meditation, which is a dynamic practice of paying close attention to what you are doing in whatever posture or situation you happen to be in. In fact, the first base in insight meditation is to establish an orientation to the sense doors. The way to orientate yourself in this practice is to literally 'come to your senses'. That is, a strategy of being fully aware of all your activities through a conscious orientation to the five senses and the 'sixth sense' - the consciousness. The Six Sense Doors is the name for the five physical senses: eye, ear, nose, tongue and body and the sixth sense - which is a collective term for the five kinds of consciousness: eye-consciousness, ear-consciousness, etc. So, the practice is to be present and consciously attentive at the predominant door or sense base. For example, being on guard at the eye-door allows you to notice the effects of the contact between the eye and the visible objects and how you are relating to them. This orientation to any sense door brings awareness of what is happening during any sense impression and with it the ability to monitor the associated feelings and consciousness that arise. First ask yourself a checking question . . .
Where are you orientated at this present moment? What sense impression is predominant now? Is it the eye-door as you view the screen, the ear-door attracted by outside sounds or the touch sensations of the body's contact on the chair your sitting on. Now is the time to establish the habit of being consciously present at a particular sense door and be noticing what is happening during a sense impression. Stop now f or 2 minutes, choose a sense-door and be knowing what is happening there: what feeling is present, the quality of that feeling, is it pleasant, unpleasant or neutral; the associated thought and particularly notice the changes. Try to establish the habit of asking yourself a checking question during the day as to what sense door you are at and what is happening there. The first step in finding a balanced sitting posture is to rest the awareness on the various sitting touch points, softening onto the support given by the cushion/chair. A balanced, alert posture is then brought about by scanning the body in order to "relax upwards" (you may have noticed how a 5-year-old sits up in a balanced way without effort). 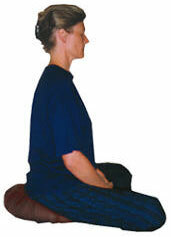 Allow the head to balance freely on the spine, checking that the head is not pulled back or fixed. Allow the chin to drop so that the eyes and ears are at about the same level. If sitting on the floor, use cushion(s) so that the knees are below the hips and in contact with the floor (otherwise the back will be collapsed) or else use a chair with a firm base (not a sofa). Try radiating loving-kindness above and below and in all directions around you to check that you are not holding or contracting in the front or the back, etc. Check that the breathing is free and easy - any restriction indicates a fixed posture. It is useful to spend 5 minutes scanning the body in this way. Note that there is no such thing as "perfect posture" and postural aches will come and go as a natural part of the unfolding practice. If pain becomes overwhelming or is a signal of injury, mindfully adjust the posture after noting the various sensations. However, as concentration develops, sensations of hotness, stiffness and itchiness will arise as part of the contemplation of feeling/sensation and it is important to note them mindfully without fidgeting. The ideal is an upright, alert posture. Slumping only increases the pressure on the legs and discomfort in the back. It is important to attend to your posture with wisdom, not insensitive will-power. Posture will improve with time, but you need to work with the body, not use force against it. Use a small firm cushion underneath and toward the back of the buttocks to support the angle of the hips. If you have a lot of pain during a period of sitting, change posture, sit on a small stool or chair, or stand up for a while.  Are the hips leaning back? This will cause a slump.  The small of the back should have its natural, unforced curve so that the abdomen is forward and 'open'.  Imagine that someone is gently pushing between the shoulder blades, while keeping the muscles relaxed.  Note, and gently release, any tension in the neck/shoulder region. Settle into a comfortable, upright balanced posture. Then on the basis of working from the gross to the subtle, from the body to the mind, feel the touch sensations of hardness or softness from the body's contact (earth element). This anchors the attention to the body, especially when assisted by the mental label of 'touching','touching'. Then tune into the natural rise and fall movement of the lower abdomen, making a mental note or label of 'rising', 'rising' concurrent with the upward movement, and 'falling', 'falling' with the downward movement. This gives you a reference point or primary object to establish the attention on. Having established on the movement of the abdomen as a base be wary of clinging to it. When secondary object arises, such as thinking, sensations or mind-states, they too must be noted until they disappear. Only then, if nothing else takes your attention, return to noting the rising and falling movement of the abdomen as your primary object; but always be prepared to attend to secondary objects (sensations, feelings, mind-states and thinking) as they arise. NB It is important to be alert to the specific characteristics of the various elements under observation. For example, the series of sensations from the abdomen movement ( wind element ) or the specific characteristics found in pain such as heat, throbbing, etc. ( fire element) . Try the traditional sitting posture as it is helpful in intense practice; it gives the right environmental conditions and allows for a fine focus on the body's elements and subtle mind events. The technique of walking meditation is essentially about the awareness of movement as you note the component parts of the steps. Alternating walking with sitting meditation helps to keep your meditation practice in balance. Walking meditation is also a skilful way to energise the practice if the calming effect of sitting is making you dull or you are becoming over concentrated. Establish the attentiveness by first noting the standing posture and the touch sensations of the feet at the start of the walking track. (You will need to find a walking path with a level surface from five to ten metres on which you walk back and forth). The arms should hang naturally with the hands lightly clasped in front. Allow the eyes to gaze at a point about two metres in front of you on the ground to avoid visual distractions. Then as you walk keep the attention on the sole of the foot, not on the leg or any other part of the body. For the first five minutes you can note just three parts of the step: 'lifting', 'pushing', 'dropping'. Then mentally note or label each step part by part building up the noting to its six component parts: ' raising ', 'lifting', 'pushing', 'dropping', 'touching' and ' pressing ' - concurrent with the actual experience of the movement. While walking and noting the parts of the steps you will probably find you are still thinking. Not to worry, keep focused on the noting of the steps if the thoughts are experienced just as 'background thoughts'. However, it you find you have been walking 'lost in thought' you must stop and vigorously note the thinking as 'thinking', 'thinking', 'thinking'. Then re-establish your attention on the movement and carry on. Also be careful that the mental noting does not become mechanical so that you lose the experience of the movement. If that is the case then the mental noting can be dropped. Try to do a minimum walking period of half an hour and build it up to a full hour. Strategically it is better to do a walking period before a sitting session as it brings balance into the practice. If you can alternate the walking and sitting sessions without any major breaks it will develop a continuity of awareness that naturally carries through into the awareness of your daily activities. An image often used to describe the practice of meditative attention is that of walking a tightrope. To succeed in this art you must necessarily pay attention to your balance. This applies especially to how you are relating to things - your attitude. The untrained mind is constantly reaching out to pull at desirable objects or pushing away unpleasant objects; this habit of ' pushing and pulling ', liking/disliking, is the cause of much stress, loss of energy and imbalance. So, keeping your balance is developing a mind that does not cling or reject, like or dislike and is without attachment or condemnation. Being attentive with compassionate equanimity towards your experience will bring 'balance of mind', which is the Buddha's Middle Way.  Witnessing - noting impartially whatever you are experiencing while you are experiencing it without evaluation or judgments.  Letting go - rather than constantly seeking gratification of wishes and desires. For a meditator, there needs to be at least some degree of giving up or 'non-clinging' to create the space to see.  Removing the censor - by an attitude of acceptance of all thoughts, feelings, emotions and sensations into awareness without discrimination.  Attitude of neutrality - that is, impeccably registering physical and mental events without posturing or positioning yourself to them.  Receptivity - that is, being alert, sensitive and intimate with what is observed from a place of relaxed receptivity. By following this meditative way of relating to your experience, especially in everyday life, the practice matures as wise attention with on-looking equanimity. Not only does this brings equilibrium into your own life, with great benefit to your relationships, but it will be naturally expressed as a compassionate, caring outlook for all suffering existence. Linking the three aspects of practice sitting, walking and awareness of daily activities creates an unbroken thread of awareness throughout the day and will help to integrate the practice into your daily life. While doing sitting meditation - focus primarily on the body elements, switching to the other spheres of attention as they arise and become predominant. Alternate the sitting with a walking session - where the steps in walking are noted in detail with the attention focused on the sensations from movement. During some daily activity - pay close attention to and label all body movements and actions as continuously as possible. Be noticing of feelings, mind-states and thoughts as they arise. Be especially mindful during the 'travel time' between each session and the change of body postures. Rather than abruptly ending a session, make a gentle transition at the end of a formal sitting or walking period to the following activity. In this way you will carry through and sustain the quality cultivated in the session, be it calm, awareness or concentration. This continuity is the key to deepening the practice and will eventually lead to penetrative insights. For awareness to deepen, continuity of attention, which gives momentum to the practice, needs to be maintained for at least a few hours in the day. Continuity arises through careful and precise attention to movements, actions, feelings and mind-states, whatever is prominent, for as long as possible in whatever situation during the daily routine. Nothing can be dismissed as unimportant when noting daily activities: domestic chores, eating, cleaning your teeth. Any and every movement and activity is repeatedly noted in order to establish the habit so that it becomes your second nature to note during the daily routine. Of course, this is not easy to establish and so requires patience, perseverance and a sense of humour - especially when you feel frustrated by constant forgetfulness! It is helpful to reinforce your efforts in being attentive in daily life, by reviewing or taking stock of you daily notings. You can record your efforts in a meditation diary, so long as you are careful not to make any judgments on the quality of the practice. The image most often associated with meditation is that of a sitting Buddha fixed in a crossed-legged posture. While such a representation is undoubtedly inspirational and aesthetically pleasing, it unfortunately suggests to the uninitiated that meditation is merely a static, "statue-like" pursuit. If meditation is to have any relevance to everyday life it has to be done at home. This does not just mean your residence but wherever your attention happens to reside. To meditate at home requires a 'hands-on', dynamic practice that is not restricted to any particular time, place or posture. When applied in this way, it naturally becomes integrated into the ordinary activities of life and becomes the basis for a meditative lifestyle in everyday life. Yet it has to be acknowledged that integrating meditation into daily life is not easy. Therefore you need to purposefully set yourself up to do it; good intention is not enough. There has to be commitment. So consider your priorities, what is more important, hours sitting in front of the TV screen (or computer monitor ;-) or a half to an hour or so of sitting meditation. The regular daily home sit is the anchor for the practice. Even if it is only used as a form of mental hygiene, as in unstressing , it will greatly contribute towards harmonising family and work relationships. Essentially meditating at home is about paying attention. The actual meaning of 'attention' indicates its practice: 'to attend upon', 'to be present with'. So by being attentive 'presence of mind' is developed. While there are degrees of attention (down to lack of attention), it can be said that there are two types: natural attention, which is 'automated attention' and the intentionally 'deployed' attention that is developed in 'meditative attention'. Deployed attention is either passive, or in the sense of being applied, active. The passive mode is 'bare attention', that is just registering what is happening, in a receptive state of mind, without reaction. While the active mode of attention is applied when any kind of movement or action is done, including active reflective thought on things observed.  Mental Content - the things of the mind e.g. thinking, concepts, ideas. Whatever is the predominant experience in any of these 'four spheres of attention' is used as a frames of reference to help guide the practice of paying attention to whatever is happening in your body and mind from moment to moment. It is important to get your bearings. So it is a matter of literally coming to your senses, by being attentive at one of the Six Sense-Doors : these are the five senses, seeing, hearing, smelling, tasting and touching plus the sixth sense or mind-door which is the consciousness or knowing. By being present with bare attention at any of these six sense-doors you observe what happens between the senses and their objects during a sense impression. One thing to notice when watching at a sense-door during a sense impression is the feelings that arise. If the feeling is unpleasant a negative reaction occurs; if it's pleasant grasping arises. Thus the mind is mostly just reacting: liking, disliking. The result is that you are being caught in the conditioned cycle of suffering at the linkage of feelings and grasping. But there is no need to be. By intercepting the primary feeling at a sense-door, without the following emotion, the feeling will go no further, therefore no attachments, no liking or disliking, end of story, end of suffering. The ability to 'home in' is really the key to this practice. Get your bearings at a sense-door and keep in mind the 'four areas of attention'. Success in doing so also depends very much on the way you are relating to things: witnessing the experience rather than just reacting to it; having an attitude of acceptance of all thoughts, feelings and mind states into awareness without discrimination or selection. The kind of 'spaciousness in the mind' allows you to be more receptive and intimate with what is observed. For awareness to deepen, continuity of attention, which gives momentum to the practice, needs to be maintained for at least a few hours in the day. Continuity arises through careful and precise attention to movements, actions, feelings and mind-states, whatever is prominent, for as long as possible in whatever situation you are in during the daily routine. Nothing can be dismissed as unimportant: domestic chores, eating, cleaning your teeth. Any and every movement and activity is repeatedly noted in order to establish the habit so that it becomes your second nature to note during the daily routine. Of course, this is not easy to establish and so requires patience, perseverance and a sense of humour, especially when you feel frustrated by constant forgetfulness. Set yourself up to do a daily mindfulness exercise using 'triggers' as reminders. Such a trigger can be every time there is contact with water to remind you to be present with whatever you are doing while you are doing it. So what are the situations when you come into contact with water: washing your hands, the dishes, hosing the garden, washing the dog, etc. If you succeed only once in paying full attention it can be the start of establishing the habit of being mindful at home. It is very helpful as well to reinforce your efforts by reviewing or taking stock of you daily notings at the end of the day. You can record your efforts in a meditation diary, so long as you do not make judgments on the quality of the practice or be discouraged by blank pages. It is important to maintain the daily meditation sits at home as a way of sustaining and stabilising your practice. With a busy life it is easy to convince yourself that you really haven't the time any more to maintain the regular sitting or when you are feeling tired, just want to drop it. Naturally, when you get stressed or overtired there is resistance to facing the stress by meditating. But it is usually only an initial resistance you have to face before you go through it. Also, do not evaluate your practice, thinking if the meditation isn't of sufficient good quality you are wasting your time. It is all grist for the mill, you must persist as it is vital to maintain the habit of practice to get the long term benefits. It is worth quoting from His Holiness, the Dalai Lama for the more compassionate aspect of the practice. "I myself feel and also tell other Buddhist that the question of Nirvana will come later. There is not much hurry. But if in day-to-day life you lead a good life, honestly with love, with compassion, with less selfishness then automatically it will lead to Nirvana. Opposite to this, if we talk about Nirvana, talk about philosophy but do not much bother about day-to-day practice, then you may reach a strange Nirvana but will not reach the correct Nirvana because your daily practice is nothing. We must implement the teaching in daily life." There is a saying that the beginning and the end of a journey are essentially the same. This is especially true of meditation. For there is nowhere you need to go to discover your true nature other than where you are now - at your home base. About Ven. Pannyavaro . . .
Venerable Pannyavaro is a senior Australian Theravada Buddhist monk who has devoted his life to the meditational aspects of the Buddha's teachings. 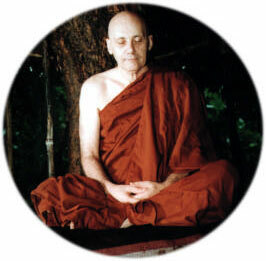 During his meditation training he practiced under several meditation masters including Venerable Sayadaw U Janaka of Chanmyay Meditation Centre, Rangoon, who is the foremost disciple of the renowned Burmese meditation master, the late Venerable Mahasi Sayadaw. As a western meditation teacher, Ven. Pannyavaro naturally empathizes with the concerns and needs of meditators in his own culture. His long training and life experience combine to bring a practical in-depth approach to the teaching of insight (vipassana) meditation in contemporary life. Pannyavaro is the resident teacher with the Buddha Dharma Education Association at its Meditation Centre at Surry Hills in Sydney. And from time to time conducts classes and workshops in centres around Australia. He also regularly leads retreats from time to time at the Blue Mountains Insight Meditation Centre, Medlow Bath. If you would like to develop your meditation practice further with this teacher, feel free to contact Buddha Dharma Education at the contact information below. In this way you'll received information on meditation classes, workshops and longer retreats. Go online to find Insight Meditation presented as a series of teachings and practical instruction by seven highly experienced and regarded teachers of Insight Meditation. Also you can find instruction on Loving-kindness meditation at various levels.